A bit of news about the SoCal RSA meeting we had on Saturday morning, August 13: in my opinion, it was one of the better meetings we’ve had over the past five years or so. Fifteen members showed up and several interesting items were brought in for discussion. 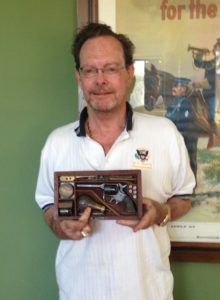 Jim Howatt brought in a Model 1882 Remington Lee rifle that for the longest time was thought to be chambered in .43 Spanish but when inspected closely turned out to be chambered in 45-70. We also learned that this model used the newly patented Lee-Diss magazine. This magazine patent covered the rolled over sides of the top, which held cartridges in place until engaged and pushed forward by the bolt. Jim also commented that Colt early semi-automatic pistols used this type of magazine and paid Remington a royalty for its use. The bottom plates of these magazines were marked with the patent date “Sept 9, 1884”. 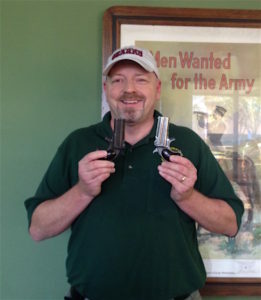 RSA Director Jeff Veselenak (left) brought in about a half dozen pocket pistols, including one of the early model Double Derringers without the ejector. Knowing he was bringing it allowed Doug Drummond to bring in several examples of early Double Derringers from his collection; this prompted a lengthy discussion enjoyed by all. RSA Director Mike Lawler dazzeled us all with a beautiful example of a Model 1889 side-by-side Grade 2 shotgun from his top notch collection. Mike also brought in a Marlin .410 lever action. Having a production date of 2004-2004, it was thought to be affiliated with Remington Arms Co., but the barrel bore the proof stamp of REP in the oval. Mike’s question was, did anyone knew if Remington built the barrels, proof fired the barrels, or both or none? When we left the question remained unanswered. Jim Ryan (far left) brought in one of the 10,001 Springfield 1871 Army Rolling Block rifles. Ed Cote (immediate left) showed a Ryder Double Action revolver, cased with all of the accouterments and shared a most entertaining story about his highly questionable safety procedures during test firing antique guns in his office and garage. Ron Covey brought in a Model 721 and Model 722 and led a discussion about short action versus long action rifles. I raided my printed files and brought in a pristine 1896 Remington Bicycle catalog along with a framed period advertisement of Remington Bicycles. 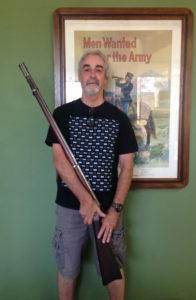 Jim Bailey shared one of the scarce early Model 81 rifles chambered in .25 Remington; he wanted the group to assist him in verifying the originality of the rifle, whether it was a rebarreled example or not. That pretty much ended the meeting and we adjourned to the showroom of Carol Watsons Orange County Auction to view the material coming up at her next auction. And that’s what I’m talking about when I say, far better than the news in all ways, we’re Sharing The History.